Sixteen high-achieving local students were awarded at the first ever BTEC Outstanding Student Awards Presentation Ceremony today. The awards provide an excellent platform for students, teachers, schools and colleges to celebrate their outstanding achievements in vocational learning. This year’s winners are a tribute to the commitment and hard work of Hong Kong’s best in education provision and learning. 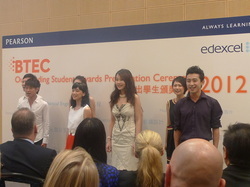 The BTEC Outstanding Student Awards Presentation Ceremony 2012 was held at the British Consulate-General in Hong Kong, and attended by Mr Andrew Seaton, British Consul-General to Hong Kong and Macao, as a guest speaker and award presenter. With the Hong Kong Advanced Level Examinations came to an end in May, MacGregor Business School has launched a series of education events to help Form 7 students search for a better pathway to higher education. 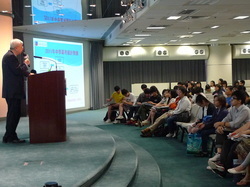 In the EDUplus education fair, Professor Ho, our guest speaker, delivered a talk named "Flexible Pathways to the University". He encouraged students to consider different pathways to university, which included the BTEC HND programmes taught in Hong Kong. The talk was a great success and it was attended by over 100 students and parents. 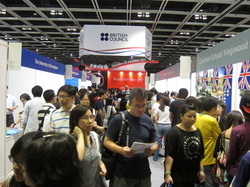 This years' British Council UK Education Exhibition took place in August at the HKCEC. Edexcel and MacGregor joined the event as usual. We saw an unprecedented number of students and parents and our staff experienced some very busy moments.More and more students come to the event looking for Edexcel BTEC qualifications offered in local centres. The response from students and parents was overwhelmingly positive and the event certainly helped build credibility for our school and the Edexcel brand in Hong Kong.